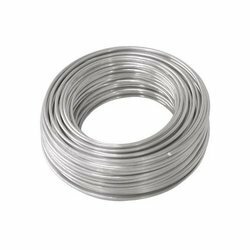 Our product range includes a wide range of aluminum polyester wires. We are the leading manufacturer and supplier of wide range of Aluminum Polyester Wires . Aluminum Enameled Wires having code PEW that are used to prepare windings of various electrical machines of home appliances and many more. These have thermal capacity of 155 degree centigrade and diameter range from 0.08 mm to 1.6 mm (8 Swg to 43 Swg). We are renowned organization for providing complete solution of Wending Wires. We follow ISO standards and IEC, IS, DIN specifications in our wide range of products. We do quality checking at each stage of production ensuring better durability with high tensile strength. We do International standard packaging in our wide range of products. We have a special team for packaging of our wide range of products before packaging of our products we do quality checking ensuring product meets required specifications. PT 90 and as per the requirement of Customer.